At Bishop Benfield's annual visit to St. Margaret's last Sunday, he reminded those being confirmed and received that the tradition of conferring a blessing through touch began nearly 1900 years ago. When a priest consecrates the sacrament at Holy Communion, they touch the bread and wine. 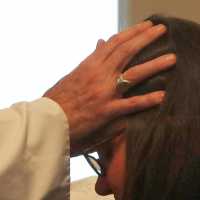 When a bishop confirms or receives a new person into the Church, he or she lays their hands upon them. Through a simple touch, we are reminded that we are part of God's Incarnation in Jesus Christ, and bless one another by the Holy Spirit. 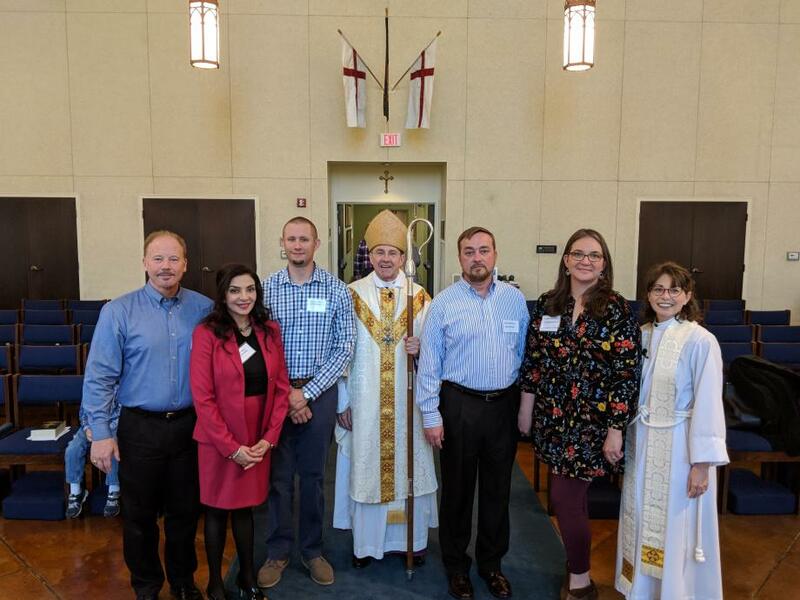 This Sunday, Leslie Hutchins and Matthew Stone were Confirmed as members of the Communion of Saints, and Absalom and Gina Tilley and Boyd Hutchins (having already been confimed in other Christian traditions) were Received into the Episcopal Church by our bishop. Through prayer and touch, they have been joined with us who seek to follow Christ and love our neighbors. In addition to this wonderful celebration, we also had the opportunity to do a "topping out" for the new Peggy Bosmyer Christian Formation Center. As we near the completion of the steel frame, all were invited to sign their name to one of the steel beams to signify that we are Building the Good News together. Again, we find that through our touch, we confer blessing. There's no doubt that the ministry in this new building will be mightily blessed! If you missed this Sunday, you can still sign your name to the beam for at least one more week. Come and make your mark of blessing soon!